This is the presence of the operating of language. This is also the presence of the noticing of the operating of language. In fact, even the word “noticing” is itself the operating of language. There is no word that is not the operating of language. The word presence is the operating of language, too. The words “the operating of language” are of course also the operating of language. The operating of language includes every instance of labeling. To reference the noticing of any particular thing is to reference the labeling of a particular thing in language. Thus, noticing something and labeling something are both the operating of language. What something can be noticed without labeling it? Of course, the presence of noticing is also vast. The presence of noticing can include the presence of the noticing of a perceiving that is distinct from the presence of labeling, such as a development that does not quite fit any particular label already operating in language. In other words, there can be the presence of noticing a perceiving of the distinction between perceiving and labeling. Noticing and perceiving are basically two labels for the same thing. Every noticing is also a perceiving. However, the noticing of the operating of language can begin and end, like when there is the noticing of a movement or a shape or an unfamiliar sound. The presence of noticing remains with or without the operating of language. The presence of breathing is the noticing of breathing. That is, noticing always involves a presence. There is no noticing of an absence. There is only the noticing of distinction among various forms of presence. There can be the noticing of the operating of language in contrast to the noticing of other developments, such as the hearing of sounds or the seeing of light and colors and shapes. While the operating of language may involve the hearing of sounds and even the seeing of symbolic shapes such as letters, there are other instances of the hearing of sounds and seeing of shapes distinct from the symbolic sounds and symbolic shapes of language. There can be the noticing of both the actual sound of an “o” sound as well as the labeling of that sound specifically as an “o” sound. There could also be the presence of the noticing of the “o” sound as coming from the howling of the wind or from the vocalizing of an animal such as a human or from the hum of a vibrating bowl or from the blowing of a musical instrument like a horn. So presence itself is eternal and the noticing of various temporary distinctions contrasts with the continuity of presence itself. When noticing the distinction between a familiar sound that is automatically labeled in language and an unfamiliar sound, noticing is present. So, there are three distinctions: the noticing of a sound, the noticing of the labeling of a sound, and the noticing of the distinction between the sound itself and the labeling of the sound in language. Further, there is a fourth noticing that each of those distinct instances of noticing are all the presence of noticing. In order to notice the distinction in language of “pure noticing,” other forms of the noticing of distinctions are recognized and labeled in language. There can be the noticing of sound, the noticing of labeling, and the noticing of the distinction between the noticing of sound and the noticing of labeling. Those three are all the noticing of a particular presence. None of those three are the noticing of the presence of noticing itself. All of these three distinct instances of noticing are all noticing. The noticing that all instances of noticing are all noticing is the recognition that the label “noticing” is just another symbol in language. If noticing were compared to a tree, we could say that the tree had several branches: the branch of noticing sound, the branch of noticing labeling, and the branch of noticing the distinction between noticing labeling and noticing sound, which is also the noticing of noticing itself. All three of those branches of noticing are instances of noticing. Notice that the three distinct branches of a single vine are united as branches of the same vine. We could label three distinct branches of a symbolic tree with the symbolic labels of “The Father, The Son, and The Holy Spirit (or Holy Ghost).” All three of those symbols in language would merely be symbols in language. Each of the three branches of a tree would merely be a branch of a single vine. The noticing any group of contrasting distinctions in language is presence of noticing. 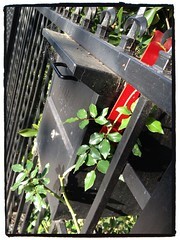 Notice the presence of noticing. The noticing of labeling itself is the presence of noticing. There is no labeling that is not labeling. There is no branch of a vine that is not a branch of a vine. There is no noticing that is not the presence of noticing. The noticing of the linguistic symbol of Heavenly Father is noticing. The noticing of the linguistic symbol of Divine Son is noticing. 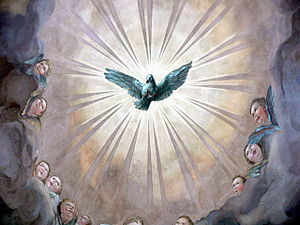 The noticing of the linguistic symbol of Holy Spirit is noticing. 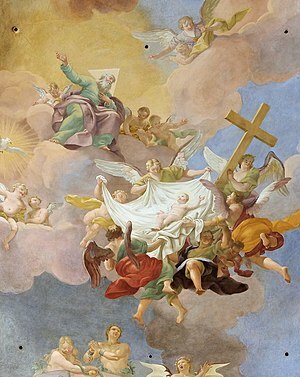 The noticing of the linguistic symbol of the Holy Trinity is distinct from noticing any of the three symbols of that Trinity. The noticing of the linguistic symbol of the Holy Trinity is the presence of the noticing of linguistic symbolism. All instances of labeling are symbolic. The noticing of the sound “o” is not the noticing of the labeling of that sound as a letter. When labeling a sound as also a letter, that is making the sound itself in to a symbol, in to an instance of language. Language is the realm of the divine or the symbolic. Language is symbolic. Language is divine. Symbolism is divine. The noticing of noticing itself is distinct from the noticing of any other particular noticing. All instances of noticing are noticing. Notice the presence of the operating of language. Notice the presence of any of the various contrasting symbolic labels in language. Notice the labeling of the inclusive category of noticing. Which symbol is not a symbol? Which branch of a tree is not equally a branch of a tree? Which is the most important linguistic symbol in the Holy Trinity: the symbol of the Heavenly Father, the symbol of the Holy Son, or the symbol of the Holy Spirit or Ghost or the Presence of the noticing of noticing itself? Is not each symbol equally symbolic? The Holy Trinity is itself just a fourth symbol in language (distinct from the other three: Father, Son, and Holy Spirit). There is no label in language that is not just a symbolic operating of language. Every symbolic label in language is the presence of the operating of language. In language, there is also a symbolic category possible that can be called “anything that is not the operating of symbolic language.” Of course, that alleged “thing beyond language” may be a joke, an instance of silly non-sense, a construction in language that is useful for distinguishing the all-inclusiveness of language itself. What is beyond language? Name one thing that is beyond language, if you can. By the way, notice that the labeling of the presence of an isolated noticing as “mine” or “not mine” may be entirely symbolic. When breathing is noticed and labeled as breathing, that is distinct from labeling the breathing as mine or not mine. “Mine” is a symbolic labeling of the operating of language. Name one thing that is beyond the operating of language. Name one thing that is not a symbolic label. Name one name that is not the operating of naming. Label one label that is not the operating of labeling. Notice one noticing that is not the operating of noticing. Even “Mine” and “my” and “me” and “I” are just symbolic operatings of language. They are namings, labelings, and noticings. All namings, all labelings, and all noticings are the operating of language. Name one word that is not the operating of language. Name one instance of the operating of language that is not the operating of language. Even foreign words, such as “anatma” and “advaita” are still words even without the recognizing of those patterns as symbolic patterns of language. Are those words still words even when not recognized as words or when no definition or comprehension of those words are present? 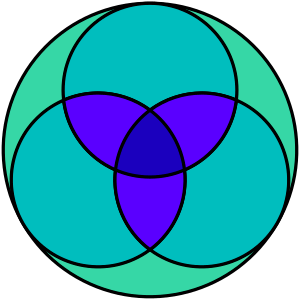 What is the difference between a round shape of a circle and the shape of the letter “o”? Perhaps it is the same difference between six and half a dozen: the difference is purely linguistic, purely symbolic, purely arbitrary. Below are two artistic depictions of the “Holy Trinity.” One is called the Trimurti of Hinduism: Brahma, Vishnu, and Siva (AKA Shiva). It is several thousand years older than the other depiction, which is Roman and would be labeled in Latin rather than Sanskrit (Brahma, Vishnu, and Shiva) or English (Heavenly Father, Divine Son, and Holy Spirit). Notice that the operating of language includes all instances of the operating of language. Are there three distinct symbolic trinities (Sanskrit, Hebrew, Latin, and English) or only one trinity but three different languages for labeling it? This entry was posted on February 19, 2012 at 5:23 am and is filed under Uncategorized. You can follow any responses to this entry through the RSS 2.0 feed. You can leave a response, or trackback from your own site. CKG wrote: And what does this have to do with Landmark Education?